Here are a couple of pictures of the Wedge Handlebar Bag with Stingray inlay I recently posted about here. The client was VERY happy and sent the photos to share. Enjoy! Three Mutts is back into full production swing this week after a mostly uneventful move (aside from it taking 5 days and my falling out of the back of the U-Haul truck on Day 2). Moving a shop is a decent sized pain in the neck. The packing and moving of stuff is tedious anyway, but when half your stuff weights over 100 pounds and is of truly odd sizes – ever try to stack eight gas tanks effectively? – it just exasperates the ordeal; not to mention the unpacking and finding of tools and daily essentials. I did find my good pair of Gingher sheers though, so it did have it benefits. With the move complete and unpacking and sorting underway, I started with the leather shop first and already have multiple jobs in process. The extra work space is turning out to be a great thing. I’ll be hitting up the good folks over at VTXCafe this week with an offer to help with designing fender bibs for all the various VTX 1300 and VTX 1800 models and hope to have those on the website in the next few weeks. I acquired a gas tank from a 1995 Harley Davidson Sportster 1200 yesterday and will be getting patterns made up for tank bibs soonish. The tank needs a little TLC (aka bondo and primer) to get it ready for bib stretching but this marks a move to include the Harley folks that I get requests from occasionally. 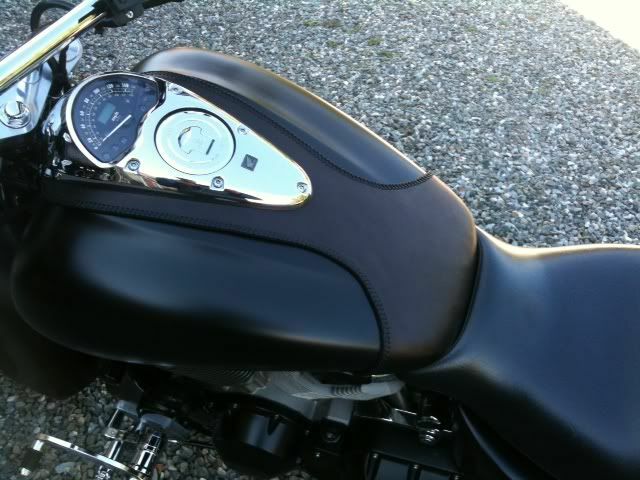 These bibs will fit all of the ’95-’03 Sportster 1200 and ’97-’03 Sportster 883 with the 3.2 gal. tank from what I can tell so far. Last but not least, I’m going to be changing the Three Mutts Customs home page a bit in the next month to include more relevant information as well as a new “Three Mutts Client Bike of the Month”. 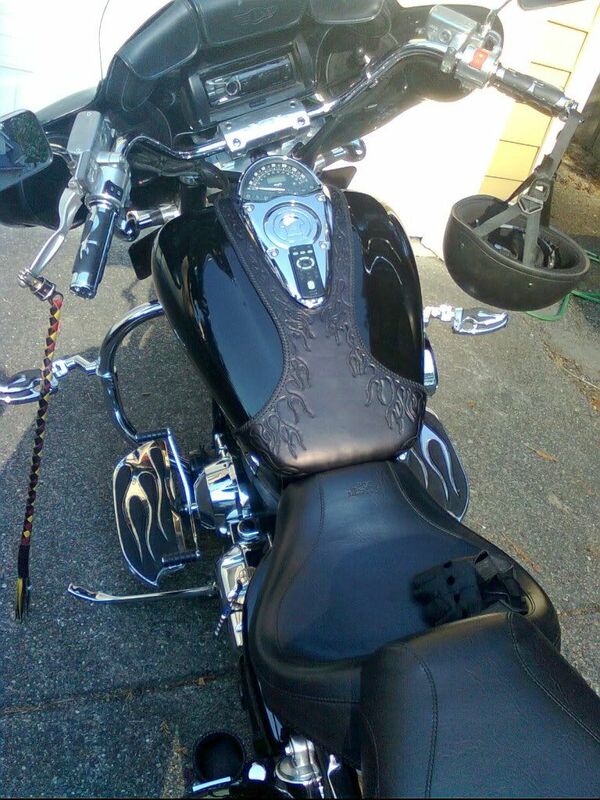 Once a month I’ll post pictures & a description of a randomly chosen 3MC leather owner’s bike to showcase. This will coincide with the new photo gallery I’m working on that should look better and display pictures & descriptions better. A new client asked me to make a handlebar bag for her 2010 Honda VT1300CT but she didn’t want the typical roll style tubular bag. She asked for something low profile but still capable of carrying a decent amount of stuff. As things progressed, we talked about doing my chaos tooling pattern on the flap, then that progressed to stingray inlay when she started talking about a gray & black color scheme. In the end I designed a wedge shaped bag that tapers both on the width and the thickness. Stingray inlay on the flap and the chaos tooling pattern on the body with matching tooling on the flap strap. The outer body is 6oz. cowhide with 4oz goatskin lining on the inside of the flap. Gray Stingray from Ostrich Market (great quality & service btw) for the inlay, kangaroo for the lacing. We also decided on lockable roller buckles for all three straps so she can lock the items in and lock the bag to the bike if desired. The inside of the bag is also lined with gray fabric and I carried the point that appears on the flap and front tooling to the inside where the goatskin & fabric meet. Visit the main website: http://www.threemuttscustoms.com! Most of my posts recently have been updates/admin stuff so I thought I would show off a few of the recent motorcycle whaletail tank bibs I have finished. Still waiting for a few more pictures to come back but this should give you all something to browse over in the meantime. 😉 Click on the photos to open a larger view. Next up is a whaletail bib with hot rod flames tooled into the leather the entire length of the bib. The flames wrap all the way down the sides around to the seat as well. Made for a 2003 VTX1800R. more to come next week including a picture of a Flarecut tank bib for the 2005 VTX1800F & C. Don’t forget to check out the new price list and available options page on the main website: http://www.threemuttscustoms.com. Have a great weekend!